Friday morning dawned bright and early in Senga, Gweru. After only a couple of hours of sleep and emerging from under a significant mound of blankets attired in my thermal long johns it was time to start explore my new surroundings, the Dingwa homestead. Dressing in a pair of comfy stretchy pants that I normally only ever wear inside my apartment I headed out to the kitchen that was bathed in sunshine and echoing with the sounds of roosters crowing from the next door yard. The ruler of this domain is the Dingwa housekeeper, Yolanda. Even though it was only 7 am and Yolanda had not gotten to bed the night before until was safely ensconced in my bed, she was up preparing for the day. This preparation includes lighting the fire outside in a lean-to in the yard to heat water for bathing. 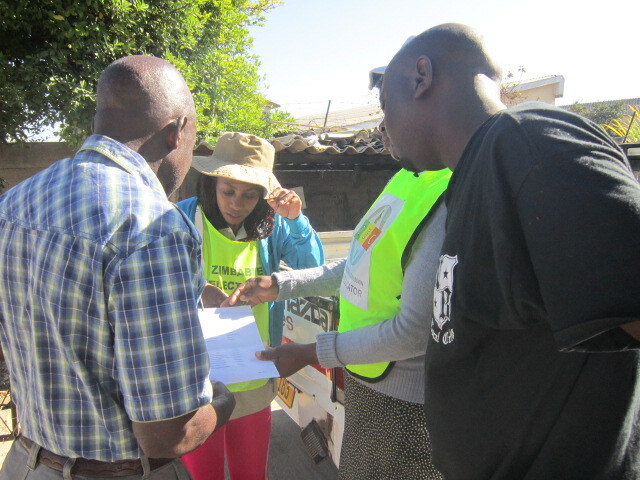 Currently parts of Zimbabwe including Gweru are facing significant water shortages. So water for the day’s activity must be trickled from the outside tap very early in the day while still available. Once the household is up and moving around the water is then heated to be used for bathing in a small wash basin. The other difficulty facing the household was the lack of electricity. Yes, I know it is a curse that I am carrying around with me! It seems that early in the week thieves had decided that it seemed like a good idea to steal the diesel petrol out of the transformer that powers the neighborhood. So, no water. No electricity. Can you spell A.D.V.E.N.T.U.R.E. So clad in my comfy stay at home clothes I went in search of a hot mug of tea. Before I had a chance to ask or even blink I was whisked out of the house by Yolanda, my new friend who informed Lawrence that we would return shortly. Having no idea where I was going or why and dressed in clothing that I would never step foot outside of my apartment in, I gamely went with the flow. Why not? Lawrence had just moments before said that he wanted to take me for a walk around the neighborhood and that I didn’t need to get changed so I felt reasonably comforted that I wouldn’t offend anyone by my wardrobe choices. Off we set with Yolanda beaming broadly and greeting everyone that we encountered. I was excited to see my surroundings in the light of day having arrived in the dark of the night. Soon it became evident that we were headed to a tiny strip mall of shops located a very short distance from the house. Once the shops were in sight, Yolanda informed me that we were purchasing eggs, bread and milk for breakfast. She was obviously proud to be showing me around and off! 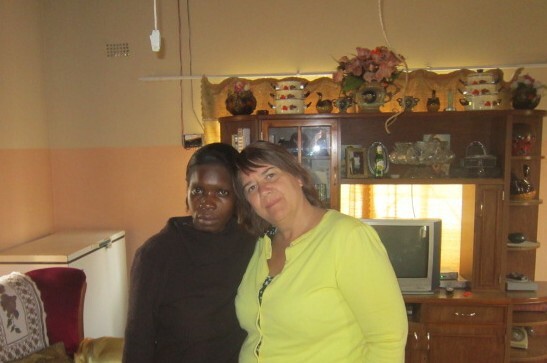 I was just as eager to experience life in Senga, Zimbabwe. After popping in and out of several of the shops it took some unearthing to locate eggs to go with the milk and bread that were more readily available. To say that I stuck out in the neighborhood like a sore thumb would be an understatement. Even dressed as I was and looking more than a little rumpled after such a short period of sleep it seemed that I was still good enough to attract a proposition or two. However, I was in safe hands and we soon had accomplished our tasks and returned home. Due to the electrical cut and the need to cook on a single gas burner to would take Yolanda time to prepare our morning meal so Lawrence, his brother-in law and I adjourned to the sunny yard to wait and chat. Of course, my appearance in the neighborhood was attracting significant attention and there were numerous drop bys and people to meet and greet. 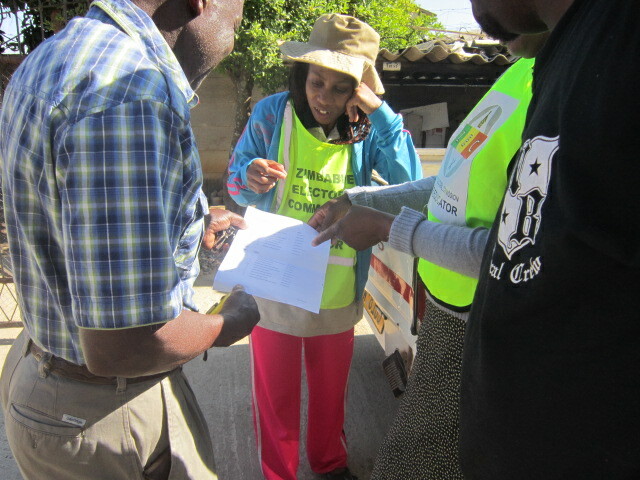 While chatting in hushed tones with the Dingwa’s lovely neighbor about the political affairs of the country who dropped by the yard but the Voter Education team bringing polling and voting information about the upcoming election in July. Oh, and yes, I am still dressed in my comfy clothes and waiting for Lawrence to zap because I am not properly attired for this more traditional culture. Zimbabwe has been ruled for more than 30 years by President Robert Mugabe who is currently 89 years old and showing no signs of retiring. There are many issues at play in Zimbabwe including poverty, economic uncertainty and upheaval, land reform displacing white farmers and political repression to name a few. For this political junkie, it was a dream come true to be so fully and quickly immersed into a real and honest dialogue on politics so soon in my visit.